As the battle for Falluja goes on, the American military estimates 600 people, whom they describe as insurgents, have been killed as well as 18 US soldiers. BBC correspondent Paul Wood, embedded with US marines in Falluja, has been witnessing the action and gave this account to the BBC's Today programme. Well it is no surprise that 600 have been killed - if indeed that figure is accurate. The marines now are pushing out south of the main road. The insurgents are believed to be confined to a narrow corridor which runs about 2km south of that road. And the technique is literally to insert the ordinary marines - the grunts as they call themselves - wait until they draw fire and then hit back with everything they have got. So you see a fleeting glimpse of one of the militants in the back of a room or jumping across a rooftop and then literally in the two hours I was out last night, thousands of rounds of ammunition are expended, tanks fire and the place is left in ruins. This is the kind of pressure that the militants are under. South of the main road now is where the main effort of the coalition forces is going to be concentrated over the next couple of days. But it will be two days of very bitter, very difficult house-to-house and street-to-street fighting. How many civilians have been killed - people who either have not left through choice or have been unable to leave - is the crucial question. I suspect we will have to wait for a definitive answer until the smoke has literally cleared. As an embedded reporter, I see literally what the military sees. It is not particularly that the marines want to censor me but I am stuck with one unit and that is all I can see. When the marines went through south of the main road last night, the streets - no surprise here - were absolutely deserted, the shops were shuttered. One can only imagine the plight of the civilians. I have questioned many times senior officers here about the use of heavy weapons because they have been using 155mm artillery in Falluja, they have been dropping 2,000 pound bombs. The bullets that they fire are high velocity. The buildings are of poor construction here - the bullets travel through the walls. 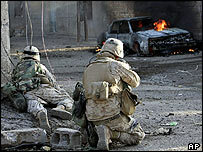 And when they see what they believe to be militants - and these marines are incredibly calm under fire, they are almost unflinching - they do wait until they see a guy with a gun but when they see that, they open up with everything they have got and the question is, how much collateral damage is there going to be? At the moment we simply do not know.